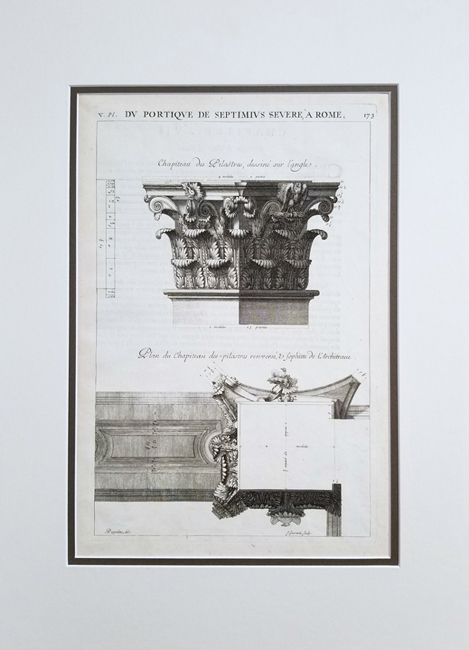 Antoine Desgodetz studied under François Blondel at the Academy of Architecture in Paris between 1672 and 1674, and was then dispatched to Rome by Louis XIVs minister, Colbert, in order to study ancient buildings. The result was a book, Ancient Edifices of Rome, dedicated to Colbert and published at the kings expense. Composed of accurate drawings of Romes main ancient buildings (as well as the amphitheater in Verona) accompanied by commentaries, the goal of the book was to provide the first precise description of ancient Roman architecture, thereby correcting errors committed by the likes of Andrea Palladio, Sebastiano Serlio, and Antonio Labacco. It remained an authoritative reference work on ancient architecture until the end of the 18th century. Prints from this publication are rare.